Post-Decision Interview or Win/Loss Analysis? 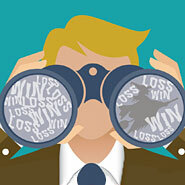 Are cast to the sales department to enter a single-reason field into a monthly loss report. If you are committed to replacing your win/loss analysis process (if conducted at all) with a post-decision interview process, what benefits should you expect? Market perception can diagnose your sales performance. It can also align your disparate sales and marketing messages. However, the greatest benefit of PDI is that it enables you to verify your competitive differentiation. When previously successful sales performance falters, the differentiation articulation has sprung a leak. WorldNet defines differentiate as “to be a distinctive feature, attribute, or trait.” The only way to rediscover differentiation messaging is to understand the prospective buyer’s perceived reality of their needs and fulfilling those needs with market-leading company attributes and unique solution features. Prospect perception offers limitless understanding of your corporate attributes. Furthermore, a validated attribute owned by your company is your differentiation. Affixing your unique company attributes to unique product, service or solution differentiation creates your message alignment and the validated articulation of your common sales cycle “story.” Of course, all prospect, client, and shareholder communications should articulate this story! This critical knowledge begins and ends with a disciplined process to successfully extract prospect perception: The Post-Decision Interview. Conduct equal interviews between all client and non-client competitions. Top reserve the statistical validation of post-decision findings, two reasons make it imperative that an equal number of wins and losses are interviewed. The first is that client-only findings (post-decision and customer satisfaction) will affix higher responses to certain “ownership” attributes such as product functionality, service quality, commitment, vision, and implementation methodology. These higher ratings are a reflection and validation of the client’s “wise” decision. As such, an equal number of prospects who are not selecting your solution are needed to counter the skewed ratings. The second reason is that a higher percentage of clients are willing to participate in interviews out of loyalty to their recent selection, so efforts must be increased to secure equal lost opportunity interviews. Conduct interviews within three months of the final decision. Interviews should be conducted prior to the prospect being live, or in production, with its acquired applications, services, or products because sales cycle knowledge is most credible immediately after decisions are made.What’s more, memory perception is diminished six months after the decision; particularly when exposed to actual product installation services, maintenance and training. The more complex the sales cycle solution is the quicker a post-decision interview needs to be scheduled because people retain less than 10% of what they have been exposed to.To counter, we have found that the order of PDI content is very important in stimulating a participant’s memory. As such, starting with simple questions about organizational statistics and the decision process enables participants time (usually 10 minutes) to forget about the event that had them distracted prior to your call. As a result, a clear channel with important knowledge opens up. At that point, competitive advantage and disadvantage is extracted and clearer decision-making thoughts are revealed. *A sales cycle is not complete until the post-decision interview is conducted. 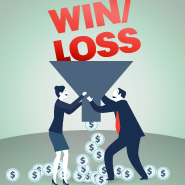 Calamitously, a one-time win/loss analysis is typically conducted by sales personnel only after a vendor has finished second in a prospect decision process. Moreover, the singular-focused objective of such an interview is usually to discover any last-minute opportunity or opening that might still secure the interviewee’s business. National statistics reveal that 90% of sales projections don’t close forecaster, so the reason for this desperate effort is more likely that the sales representative projected a “wishful” closure that wasn’t in tune with the prospect. A post-decision environment must be free of conflict or judgment if impartial knowledge is to be captured, so it must be completely devoid of salesmanship. An organization increases its probability of success if a separate department not staffed with sales-related individuals conducts the post-decision interviews. Progressively thinking organizations are embedding these people into a newly formed Sales Enablement department along with other business development individuals(e.g., Chief Branding Officer, Customer Awareness Manager, Analyst Relations). Their objective in doing so is to maintain a common pulse on their industry, corporate culture, clients, brand, prospect need sand messaging. If a non-sales environment can’t be achieved, outsource to an unbiased outside party. Avoid conflict of interest (e.g., biased sales process training firms, consultants who sell services to your prospects). Ensure a reasonable interview-to-interviewer ratio (e.g., 1200 annual interviews: 1 interviewer). Select interviewers who understand your business and sales cycle. Make sure that the deliverable is actionable (e.g., recommendations that either validate your process or verify change). Compile, compare, and present quarterly findings. A one-time interview is helpful in assessing a single opportunity, yet it provides no indication of improvement or degradation of sales performance. Therefore, scripted post-decision interviews must be collected and compiled no less than quarterly to monitor changes in buyer decision criteria, process, perception, and sales performance. Ratings must be aggregated and compared to other quarters once the analysis has been completed. Reports are suitable as a communication medium, but they are seldom read. As such, PowerPoint presentations are a better venue in enabling contextual questions to be asked that may be known by the interviewer but may have gone overlooked during the findings assessment. The findings can be entered into an Excel spreadsheet or managed using a database such as Microsoft Access, Zoho Creator(Internet-based) or Caspio (SQL Server-based). Use a metric-based and structured template. What a prospect declares after a decision process is steeped in emotion. As a result, it is easier to secure a scale of how they feel about a subject than it's to secure tangible and resolute free-form articulation of a complex sales cycle. Therefore, it is easier for an interviewee to quantify their perception of the competition, products, sales cycle performance, services, and companies when ratings (e.g., 1-10), rankings (e.g., Top1-5), or weighted priorities (e.g., High, Medium, Low) are used. Even though quantifiable evidence is preferred, capturing contextual free-form comments is essential to gaining insight into each response.It is important to mention, however, that post-decision interviews must be carefully planned to: match the stages of your sales process; narrow the interview vehicle attributes or actions to a single word or hyphenated phrase; group attribute and actions into statistics, process, criteria, and performance categories. Make the post-decision interview non-discretionary. Fewer than 20% of complex organizations conduct win/loss analysis and a lesser percentage of organizations monitor the alignment between their selling process and the buyer process. Whether the reason is fear(e.g., sales management doesn’t want executives to verify reality; marketing is unsure of its brand perception) or the value is unclear(e.g., corporate doesn’t want to invest the resources; company has not performed PDI in the past), this is an alarming oversight. Matter off act, an organization’s sales process will be out of alignment within six months of any sales training event devoid of an iterative diagnostic and alignment process. Moreover, its expensive investment into sales cycle process training is wasted. Post-decision interviews are the only means of capturing the knowledge needed to align any marketing and sales strategies to market perception. Post-decision interviews are not discretionary for successful organizations! Understand that perception is reality. Perception is more powerful than reality when a prospect evaluates a solution. Buyers buy what they believe is true. Additionally, post-decision interviews are conducted prior to a prospect or customer using the acquired products or services, so the only knowledge gained is perception. Prospect’s perception, as obtained from a post-decision interview, is required to competitively differentiate and align a vendor company, product, and service to market perception. Understand that perception is reality. By making post-decision interviews non-discretionary and by internally adopting or outsourcing a diagnostic back-end to your sales cycle process, your firm can “tune in” to market perception. Armed with reality, you will gain competitive advantage by diagnosing your sales performance, verifying your differentiation, and aligning your selling process with your buyer’s process. Ask the Experts: Can Win/Loss Speed Up the Sales Cycle?